Jude has fallen in love and she's in such a state! Her smile is 50% wider and slightly lopsided, which gives her an off-kilter charm that is completely unaffected. Everything, from her voice to her movements to her laugh, is lighter, looser. She is an entirely responsible person, but you have the sense that she and her love could just jump into a Thunderbird and roar off, having everything they need in the front seat. I had kind of forgotten this state, what another friend calls the Bumping Into Furniture Stage. In early adulthood, that stage is ubiquitous—your cohort are continually climbing into hot-air balloons, casting off the sandbags. 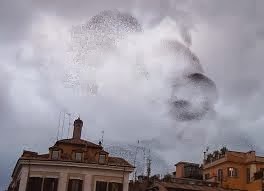 Perhaps because the phenomenon was prevalent, like a murmuration of sparrows, we lost sight of its wonder. The came midlife, when our busy-ness obscured noting the moment's giddy effervescence. If you had children, the teenage years meant watching over easily-broken and uncertain hearts. Falling in love was not quite as fun to witness when it involved a 15-year-old who wondered if he could live without a sullen girl whose ferret peed on your best jacket. Now, I am 65 and friends long on their own are falling in love—not everyone, not predictably, and often as surprising to them as to me. Lucinda called, her voice breaking with emotion, to say, "I never thought this would happen again." This post-50 falling in love is more complicated. Children weigh in, sometimes very assertively: He's not that funny. Oh no, he's got a stupid beard. Habits are more ingrained. You don't just throw your stuff in a box and move in anymore. If hope is "the thing with feathers/that perches in the soul", the most magnificent plumage belongs to rekindled hope, the reconnection with possibility, anticipation, discovery. "I'm not afraid", Lucinda said, "because I have loved before and know what that involves. I just have to trust myself." I also find friends' reactions different from thirty or forty years ago. There's still the same vetting: Is this a good person for her? But there's more acknowledgment of the ups and downs in any union, less insistence on its being perfect. Those who have stayed in love for years watch those falling in love again, and a bit of that spangly, 120-proof joy rubs off. I've witnessed this among a few friends and it's wonderful to see. I must admit to a twinge (just a twinge) of jealousy--how marvelous to experience that newness again! I've been in my relationship for almost 40 years. What a great story to share here today. Happy Valentine's Day to you, too. What a joyful post! A favorite aunt, once widowed, once divorced who'd often said she'd never marry again fell in love and remarried a couple of years ago. She's in her late 70's. They seem very happy. It does give one hope that it is never too late to find love. I wished that my Mother had found someone after my Father had passed away...it might have been complicated and my sister and I might have been concerned but wouldn't it have been nice for Mom? What a lovely, fresh approach to Valentine's Day! Have you ever read Doris Lessing's Love, Again? You make me think I should dust my copy off for a re-read . . .
Beautiful! A lovely story, written with the combination of skill and deep feeling that you do so well. Thanks for sharing, and Happy Valentine's Day to you and your noble spouse. I have a close single friend who thinks she will never find love again. It would be wonderful if she did! This is such a lovely post. I don't know if marrying at 57 counts as finding love late in life, but I do notice that my happiness made everyone around me happy too. I have a dearly loved aunt who is almost 80. Her husband died 5 years ago - she's so alive and would be so happy to find someone. Maybe we can send collective miracle vibes from here. It's great to see, isn't it! A close friend got married last year, in his mid-60s some years after a divorce, and the happiness of this couple rubs off on everyone around them. I admit to a bit of envy too -- it would be nice to feel that heady rush again -- but I certainly would never trade my long, happy marriage for it. Happy Valentine's Day to you both! Lovely, lovely, and let me be the first to send a big parcel of Valentine hopes and wishes to LPC's aunt! An old sweetheart's mother--a charming woman and a dear friend to me--lived an isolated, lonely life in a small town for many years after her husband's early death. In her seventies she began attending elderhostel courses around the country. At one of these she met a dashing retired Air Force officer, fell madly in love, and went gallivanting everywhere with him in an RV. So unlike our quiet, intellectual friend, we all thought, and a real testament to the power of romantic attraction! I often tell her story to younger women who feel stuck in despair after divorce or too many years alone. At twice their age, my friend found a crazy, beautiful love, and lived the last years of her life happier than she had ever been before. "If hope is "the thing with feathers/that perches in the soul", the most magnificent plumage belongs to rekindled hope, the reconnection with possibility, anticipation, discovery." One of the things that instantly lifts me up and gives me the feeling that everything is right in the world is seeing an elderly couple holding hands. I can't get enough of it. Even when I see an elderly couple doing something mundane such as shopping together, the husband patiently holding his wife's bag or giving gentle input produces such emotion in me. I wonder if they know the effect they're giving to those around them. A lovely post . When you are young you think love belongs to the young , little do they know . My husband & I found each other at seventeen , so almost fifty years ago now & if I catch sight of him across a crowded room , my heart still gives a little jump . Yes , we sometimes hold hands too - whether he wants to or not ! All: Comments from the heart- gracious and affirming; thank you! What a lovely story for Valentines day! I think finding love again must have such special joy, and I have been thrilled to see it happen to a couple of people i know and love. A lovely post - inspiring, thoughtful and hopeful! I loved this post and am so happy for your friend. How wonderful! Eleven years ago B saw me at the grocery store on a Thursday evening in winter. He wanted to meet me, but couldn't make himself do it. So for awhile, every Thursday, he went to the store, hoping that was my grocery night. He told his friends about me. A couple of months later, I was with a friend having dinner and he was sitting a few tables away with his college-age daughter. He told her he had to meet me. She said OK Dad, but don't take all night. We had our first date three days later and have been married almost 10 years!